"Slit experiment" redirects here. For other uses, see Diffraction. In modern physics, the double-slit experiment is a demonstration that light and matter can display characteristics of both classically defined waves and particles; moreover, it displays the fundamentally probabilistic nature of quantum mechanical phenomena. The experiment was first performed with light by Thomas Young in 1801. In 1927, Davisson and Germer demonstrated that electrons show the same behavior, which was later extended to atoms and molecules. Thomas Young's experiment with light was part of classical physics well before quantum mechanics, and the concept of wave-particle duality. He believed it demonstrated that the wave theory of light was correct, and his experiment is sometimes referred to as Young's experiment or Young's slits. The experiment belongs to a general class of "double path" experiments, in which a wave is split into two separate waves that later combine into a single wave. Changes in the path lengths of both waves result in a phase shift, creating an interference pattern. Another version is the Mach–Zehnder interferometer, which splits the beam with a mirror. In the basic version of this experiment, a coherent light source, such as a laser beam, illuminates a plate pierced by two parallel slits, and the light passing through the slits is observed on a screen behind the plate. The wave nature of light causes the light waves passing through the two slits to interfere, producing bright and dark bands on the screen — a result that would not be expected if light consisted of classical particles. However, the light is always found to be absorbed at the screen at discrete points, as individual particles (not waves), the interference pattern appearing via the varying density of these particle hits on the screen. Furthermore, versions of the experiment that include detectors at the slits find that each detected photon passes through one slit (as would a classical particle), and not through both slits (as would a wave). However, such experiments demonstrate that particles do not form the interference pattern if one detects which slit they pass through. These results demonstrate the principle of wave–particle duality. Other atomic-scale entities, such as electrons, are found to exhibit the same behavior when fired towards a double slit. Additionally, the detection of individual discrete impacts is observed to be inherently probabilistic, which is inexplicable using classical mechanics. The experiment can be done with entities much larger than electrons and photons, although it becomes more difficult as size increases. The largest entities for which the double-slit experiment has been performed were molecules that each comprised 810 atoms (whose total mass was over 10,000 atomic mass units). The double-slit experiment (and its variations) has become a classic thought experiment, for its clarity in expressing the central puzzles of quantum mechanics. Because it demonstrates the fundamental limitation of the ability of the observer to predict experimental results, Richard Feynman called it "a phenomenon which is impossible […] to explain in any classical way, and which has in it the heart of quantum mechanics. In reality, it contains the only mystery [of quantum mechanics]." 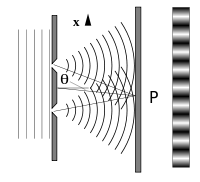 Same double-slit assembly (0.7 mm between slits); in top image, one slit is closed. 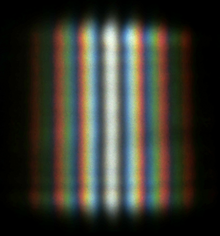 In the single-slit image, a diffraction pattern (the faint spots on either side of the main band) forms due to the nonzero width of the slit. A diffraction pattern is also seen in the double-slit image, but at twice the intensity and with the addition of many smaller interference fringes. If light consisted strictly of ordinary or classical particles, and these particles were fired in a straight line through a slit and allowed to strike a screen on the other side, we would expect to see a pattern corresponding to the size and shape of the slit. However, when this "single-slit experiment" is actually performed, the pattern on the screen is a diffraction pattern in which the light is spread out. The smaller the slit, the greater the angle of spread. The top portion of the image shows the central portion of the pattern formed when a red laser illuminates a slit and, if one looks carefully, two faint side bands. More bands can be seen with a more highly refined apparatus. Diffraction explains the pattern as being the result of the interference of light waves from the slit. Simulation of a particle wave function: double slit experiment. The white blur represents the particle. The whiter the pixel, the greater the probability of finding a particle in that place if measured. If one illuminates two parallel slits, the light from the two slits again interferes. Here the interference is a more pronounced pattern with a series of alternating light and dark bands. The width of the bands is a property of the frequency of the illuminating light. (See the bottom photograph to the right.) When Thomas Young (1773–1829) first demonstrated this phenomenon, it indicated that light consists of waves, as the distribution of brightness can be explained by the alternately additive and subtractive interference of wavefronts. Young's experiment, performed in the early 1800s, played a vital part in the acceptance of the wave theory of light, vanquishing the corpuscular theory of light proposed by Isaac Newton, which had been the accepted model of light propagation in the 17th and 18th centuries. However, the later discovery of the photoelectric effect demonstrated that under different circumstances, light can behave as if it is composed of discrete particles. These seemingly contradictory discoveries made it necessary to go beyond classical physics and take the quantum nature of light into account. The Englert–Greenberger duality relation provides a detailed treatment of the mathematics of double-slit interference in the context of quantum mechanics. A low-intensity double-slit experiment was first performed by G. I. Taylor in 1909, by reducing the level of incident light until photon emission/absorption events were mostly non overlapping. A double-slit experiment was not performed with anything other than light until 1961, when Claus Jönsson of the University of Tübingen performed it with electron beams. In 1974, the Italian physicists Pier Giorgio Merli, Gian Franco Missiroli, and Giulio Pozzi repeated the experiment using single electrons and biprism (instead of slits), showing that each electron interferes with itself as predicted by quantum theory. In 2002, the single-electron version of the experiment was voted "the most beautiful experiment" by readers of Physics World. In 2012, Stefano Frabboni and co-workers eventually performed the double-slit experiment with electrons and real slits, following the original scheme proposed by Feynman. They sent single electrons onto nanofabricated slits (about 100 nm wide) and, by collecting the transmitted electrons with a single-electron detector, they could show the build-up of a double-slit interference pattern. An important version of this experiment involves single particles (or waves—for consistency, they are called particles here). 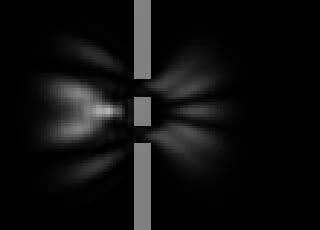 Sending particles through a double-slit apparatus one at a time results in single particles appearing on the screen, as expected. Remarkably, however, an interference pattern emerges when these particles are allowed to build up one by one (see the adjacent image). This demonstrates the wave–particle duality, which states that all matter exhibits both wave and particle properties: the particle is measured as a single pulse at a single position, while the wave describes the probability of absorbing the particle at a specific place on the screen. This phenomenon has been shown to occur with photons, electrons, atoms and even some molecules, including buckyballs. So experiments with electrons add confirmatory evidence to the view that electrons, protons, neutrons, and even larger entities that are ordinarily called particles nevertheless have their own wave nature and even a wavelength (related to their momentum). The probability of detection is the square of the amplitude of the wave and can be calculated with classical waves (see below). The particles do not arrive at the screen in a predictable order, so knowing where all the previous particles appeared on the screen and in what order tells nothing about where a future particle will be detected. If there is a cancellation of waves at some point, that does not mean that a particle disappears; it will appear somewhere else. Ever since the origination of quantum mechanics, some theorists have searched for ways to incorporate additional determinants or "hidden variables" that, were they to become known, would account for the location of each individual impact with the target. More complicated systems that involve two or more particles in superposition are not amenable to the above explanation. A well-known thought experiment predicts that if particle detectors are positioned at the slits, showing through which slit a photon goes, the interference pattern will disappear. This which-way experiment illustrates the complementarity principle that photons can behave as either particles or waves, but cannot be observed as both at the same time. Despite the importance of this thought experiment in the history of quantum mechanics (for example, see the discussion on Einstein's version of this experiment), technically feasible realizations of this experiment were not proposed until the 1970s. (Naive implementations of the textbook gedanken experiment are not possible because photons cannot be detected without absorbing the photon.) Currently, multiple experiments have been performed illustrating various aspects of complementarity. An experiment performed in 1987  produced results that demonstrated that information could be obtained regarding which path a particle had taken without destroying the interference altogether. This showed the effect of measurements that disturbed the particles in transit to a lesser degree and thereby influenced the interference pattern only to a comparable extent. In other words, if one does not insist that the method used to determine which slit each photon passes through be completely reliable, one can still detect a (degraded) interference pattern. Wheeler's delayed choice experiments demonstrate that extracting "which path" information after a particle passes through the slits can seem to retroactively alter its previous behavior at the slits. Quantum eraser experiments demonstrate that wave behavior can be restored by erasing or otherwise making permanently unavailable the "which path" information. A simple do-it-at-home illustration of the quantum eraser phenomenon was given in an article in Scientific American. If one sets polarizers before each slit with their axes orthogonal to each other, the interference pattern will be eliminated. The polarizers can be considered as introducing which-path information to each beam. Introducing a third polarizer in front of the detector with an axis of 45° relative to the other polarizers "erases" this information, allowing the interference pattern to reappear. This can also be accounted for by considering the light to be a classical wave,:91 and also when using circular polarizers and single photons. :6 Implementations of the polarizers using entangled photon pairs have no classical explanation. In a highly publicized experiment in 2012, researchers claimed to have identified the path each particle had taken without any adverse effects at all on the interference pattern generated by the particles. In order to do this, they used a setup such that particles coming to the screen were not from a point-like source, but from a source with two intensity maxima. However, commentators such as Svensson have pointed out that there is in fact no conflict between the weak measurements performed in this variant of the double-slit experiment and the Heisenberg uncertainty principle. Weak measurement followed by post-selection did not allow simultaneous position and momentum measurements for each individual particle, but rather allowed measurement of the average trajectory of the particles that arrived at different positions. In other words, the experimenters were creating a statistical map of the full trajectory landscape. A laboratory double-slit assembly; distance between top posts approximately 2.5 cm (one inch). Near-field intensity distribution patterns for plasmonic slits with equal widths (A) and non-equal widths (B). In 1967, Pfleegor and Mandel demonstrated two-source interference using two separate lasers as light sources. It was shown experimentally in 1972 that in a double-slit system where only one slit was open at any time, interference was nonetheless observed provided the path difference was such that the detected photon could have come from either slit. The experimental conditions were such that the photon density in the system was much less than unity. In 1999, the double-slit experiment was successfully performed with buckyball molecules (each of which comprises 60 carbon atoms). A buckyball is large enough (diameter about 0.7 nm, nearly half a million times larger than a proton) to be seen under an electron microscope. In 2005, E. R. Eliel presented an experimental and theoretical study of the optical transmission of a thin metal screen perforated by two subwavelength slits, separated by many optical wavelengths. The total intensity of the far-field double-slit pattern is shown to be reduced or enhanced as a function of the wavelength of the incident light beam. In 2012, researchers at the University of Nebraska–Lincoln performed the double-slit experiment with electrons as described by Richard Feynman, using new instruments that allowed control of the transmission of the two slits and the monitoring of single-electron detection events. Electrons were fired by an electron gun and passed through one or two slits of 62 nm wide × 4 μm tall. In 2013, the double-slit experiment was successfully performed with molecules that each comprised 810 atoms (whose total mass was over 10,000 atomic mass units). Hydrodynamic analogs have been developed that can recreate various aspects of quantum mechanical systems, including single-particle interference through a double-slit. A silicone oil droplet, bouncing along the surface of a liquid, self-propels via resonant interactions with its own wave field. The droplet gently sloshes the liquid with every bounce. At the same time, ripples from past bounces affect its course. The droplet's interaction with its own ripples, which form what is known as a pilot wave, causes it to exhibit behaviors previously thought to be peculiar to elementary particles — including behaviors customarily taken as evidence that elementary particles are spread through space like waves, without any specific location, until they are measured. However, more complicated systems that involve two or more particles in superposition are not amenable to such a simple, classically intuitive explanation. Accordingly, no hydrodynamic analog of entanglement has been developed. Nevertheless, optical analogs are possible. Photo of the double-slit interference of sunlight. Two slits are illuminated by a plane wave. Much of the behaviour of light can be modelled using classical wave theory. The Huygens–Fresnel principle is one such model; it states that each point on a wavefront generates a secondary wavelet, and that the disturbance at any subsequent point can be found by summing the contributions of the individual wavelets at that point. This summation needs to take into account the phase as well as the amplitude of the individual wavelets. It should be noted that only the intensity of a light field can be measured—this is proportional to the square of the amplitude. 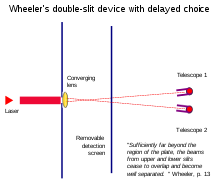 In the double-slit experiment, the two slits are illuminated by a single laser beam. If the width of the slits is small enough (less than the wavelength of the laser light), the slits diffract the light into cylindrical waves. These two cylindrical wavefronts are superimposed, and the amplitude, and therefore the intensity, at any point in the combined wavefronts depends on both the magnitude and the phase of the two wavefronts. The difference in phase between the two waves is determined by the difference in the distance travelled by the two waves. For example, if two slits are separated by 0.5 mm (d), and are illuminated with a 0.6μm wavelength laser (λ), then at a distance of 1m (z), the spacing of the fringes will be 1.2 mm. Where the sinc function is defined as sinc(x) = sin(x)/x for x ≠ 0, and sinc(0) = 1. This is illustrated in the figure above, where the first pattern is the diffraction pattern of a single slit, given by the sinc function in this equation, and the second figure shows the combined intensity of the light diffracted from the two slits, where the cos function represent the fine structure, and the coarser structure represents diffraction by the individual slits as described by the sinc function. Similar calculations for the near field can be done using the Fresnel diffraction equation. As the plane of observation gets closer to the plane in which the slits are located, the diffraction patterns associated with each slit decrease in size, so that the area in which interference occurs is reduced, and may vanish altogether when there is no overlap in the two diffracted patterns. Like the Schrödinger's cat thought experiment, the double-slit experiment is often used to highlight the differences and similarities between the various interpretations of quantum mechanics. The Copenhagen interpretation, put forth by some of the pioneers in the field of quantum mechanics, asserts that it is undesirable to posit anything that goes beyond the mathematical formulae and the kinds of physical apparatus and reactions that enable us to gain some knowledge of what goes on at the atomic scale. One of the mathematical constructs that enables experimenters to predict very accurately certain experimental results is sometimes called a probability wave. In its mathematical form it is analogous to the description of a physical wave, but its "crests" and "troughs" indicate levels of probability for the occurrence of certain phenomena (e.g., a spark of light at a certain point on a detector screen) that can be observed in the macro world of ordinary human experience. The probability "wave" can be said to "pass through space" because the probability values that one can compute from its mathematical representation are dependent on time. One cannot speak of the location of any particle such as a photon between the time it is emitted and the time it is detected simply because in order to say that something is located somewhere at a certain time one has to detect it. The requirement for the eventual appearance of an interference pattern is that particles be emitted, and that there be a screen with at least two distinct paths for the particle to take from the emitter to the detection screen. Experiments observe nothing whatsoever between the time of emission of the particle and its arrival at the detection screen. If a ray tracing is next made as if a light wave (as understood in classical physics) is wide enough to take both paths, then that ray tracing will accurately predict the appearance of maxima and minima on the detector screen when many particles pass through the apparatus and gradually "paint" the expected interference pattern. The Copenhagen interpretation is similar to the path integral formulation of quantum mechanics provided by Feynman. The path integral formulation replaces the classical notion of a single, unique trajectory for a system, with a sum over all possible trajectories. The trajectories are added together by using functional integration. To summarize, the probability distribution of the outcome is the normalized square of the norm of the superposition, over all paths from the point of origin to the final point, of waves propagating proportionally to the action along each path. The differences in the cumulative action along the different paths (and thus the relative phases of the contributions) produces the interference pattern observed by the double-slit experiment. Feynman stressed that his formulation is merely a mathematical description, not an attempt to describe a real process that we can measure. According to the relational interpretation of quantum mechanics, first proposed by Carlo Rovelli, observations such as those in the double-slit experiment result specifically from the interaction between the observer (measuring device) and the object being observed (physically interacted with), not any absolute property possessed by the object. In the case of an electron, if it is initially "observed" at a particular slit, then the observer–particle (photon–electron) interaction includes information about the electron's position. This partially constrains the particle's eventual location at the screen. If it is "observed" (measured with a photon) not at a particular slit but rather at the screen, then there is no "which path" information as part of the interaction, so the electron's "observed" position on the screen is determined strictly by its probability function. This makes the resulting pattern on the screen the same as if each individual electron had passed through both slits. It has also been suggested that space and distance themselves are relational, and that an electron can appear to be in "two places at once"—for example, at both slits—because its spatial relations to particular points on the screen remain identical from both slit locations. Physicist David Deutsch argues in his book The Fabric of Reality that the double-slit experiment is evidence for the many-worlds interpretation. However, since every interpretation of quantum mechanics is empirically indistinguishable, some scientists are skeptical of this claim. An alternative to the standard understanding of quantum mechanics, De Broglie–Bohm theory states that particles have precise locations at all times, and that their velocities are influenced by the wave-function. So while a single particle will travel through one particular slit in the double-slit experiment, the so-called "pilot wave" that influences it will travel through both. The two slit de Broglie-Bohm trajectories were first calculated by Chris Dewdney whilst working with Chris Philippidis and Basil Hiley at Birkbeck College (London). The de Broglie-Bohm theory produces the same statistical results as standard quantum mechanics, but dispenses with many of its conceptual difficulties. ^ a b c "Physicists Smash Record For Wave-Particle Duality"
^ a b c Eibenberger, Sandra; et al. (2013). "Matter-wave interference with particles selected from a molecular library with masses exceeding 10000 amu". Physical Chemistry Chemical Physics. 15 (35): 14696–14700. arXiv:1310.8343. Bibcode:2013PCCP...1514696E. doi:10.1039/C3CP51500A. PMID 23900710. ^ While there is no doubt that Young's demonstration of optical interference, using sunlight, pinholes and cards, played a vital part in the acceptance of the wave theory of light, there is some question as to whether he ever actually performed a double-slit interference experiment. Robinson, Andrew (2006). The Last Man Who Knew Everything. New York, NY: Pi Press. pp. 123–124. ISBN 978-0-13-134304-7. ^ a b Lederman, Leon M.; Christopher T. Hill (2011). Quantum Physics for Poets. US: Prometheus Books. pp. 102–111. ISBN 978-1616142810. ^ a b c d e f Feynman, Richard P.; Robert B. Leighton; Matthew Sands (1965). The Feynman Lectures on Physics, Vol. 3. Addison-Wesley. pp. 1.1–1.8. ISBN 978-0201021189. ^ Darling, David (2007). "Wave–Particle Duality". The Internet Encyclopedia of Science. The Worlds of David Darling. Retrieved 18 October 2008. ^ Leon Lederman; Christopher T. Hill. Quantum Physics for Poets. Prometheus Books, Publishers. p. 109. ISBN 978-1-61614-281-0. ^ "...if in a double-slit experiment, the detectors which register outcoming photons are placed immediately behind the diaphragm with two slits: A photon is registered in one detector, not in both..." Müller-Kirsten, H. J. W. (2006). Introduction to Quantum Mechanics: Schrödinger Equation and Path Integral. US: World Scientific. p. 14. ISBN 978-981-2566911. ^ Plotnitsky, Arkady (2012). Niels Bohr and Complementarity: An Introduction. US: Springer. pp. 75–76. ISBN 978-1461445173. ^ "It seems that light passes through one slit or the other in the form of photons if we set up an experiment to detect which slit the photon passes, but passes through both slits in the form of a wave if we perform an interference experiment." Rae, Alastair I.M. (2004). Quantum Physics: Illusion Or Reality?. UK: Cambridge University Press. pp. 9–10. ISBN 978-1139455275. ^ Feynman, The Feynman Lectures on Physics, 3:Quantum Mechanics p.1-1 "There is one lucky break, however— electrons behave just like light.". ^ See: Davisson–Germer experiment Davisson, C. J (1928). "The diffraction of electrons by a crystal of nickel". Bell System Technical Journal. 7: 90–105. doi:10.1002/j.1538-7305.1928.tb00342.x. C.S. Peirce (July 1879). "Note on the Progress of Experiments for Comparing a Wave-length with a Meter". American Journal of Science, as referenced by Crease, Robert P. (2011). World in the Balance: The historic quest for an absolute system of measurement. New York: W.W. Norton. p. 317. ISBN 978-0-393-07298-3. p. 203. ^ Greene, Brian (1999). The Elegant Universe: Super Strings, Hidden Dimensions, and the Quest for the Ultimate Theory. New York: W.W. Norton. pp. 97–109. ISBN 978-0-393-04688-5. ^ Sir Geoffrey, Ingram Taylor (1909). "Interference Fringes with Feeble Light". Prof. Cam. Phil. Soc. 15: 114. ^ Jönsson, Claus (1 August 1961). "Elektroneninterferenzen an mehreren künstlich hergestellten Feinspalten". Zeitschrift für Physik (in German). 161 (4): 454–474. Bibcode:1961ZPhy..161..454J. doi:10.1007/BF01342460. ISSN 0044-3328. ^ Jönsson, Claus (1 January 1974). "Electron Diffraction at Multiple Slits". American Journal of Physics. 42 (1): 4–11. Bibcode:1974AmJPh..42....4J. doi:10.1119/1.1987592. ISSN 0002-9505. ^ Merli, P G; Missiroli, G F; Pozzi, G (1976). "On the statistical aspect of electron interference phenomena". American Journal of Physics. 44 (3): 306–307. Bibcode:1976AmJPh..44..306M. doi:10.1119/1.10184. ^ Rosa, R (2012). "The Merli–Missiroli–Pozzi Two-Slit Electron-Interference Experiment". Physics in Perspective. 14 (2): 178–194. Bibcode:2012PhP....14..178R. doi:10.1007/s00016-011-0079-0. PMC 4617474. PMID 26525832. ^ "The most beautiful experiment". Physics World 2002. ^ Frabboni, Stefano; Gabrielli, Alessandro; Carlo Gazzadi, Gian; Giorgi, Filippo; Matteucci, Giorgio; Pozzi, Giulio; Cesari, Nicola Semprini; Villa, Mauro; Zoccoli, Antonio (May 2012). "The Young-Feynman two-slits experiment with single electrons: Build-up of the interference pattern and arrival-time distribution using a fast-readout pixel detector". Ultramicroscopy. 116: 73–76. doi:10.1016/j.ultramic.2012.03.017. ISSN 0304-3991. ^ Greene, Brian (2007). The Fabric of the Cosmos: Space, Time, and the Texture of Reality. Random House LLC. p. 90. ISBN 978-0-307-42853-0. ^ Donati, O; Missiroli, G F; Pozzi, G (1973). "An Experiment on Electron Interference". American Journal of Physics. 41 (5): 639–644. Bibcode:1973AmJPh..41..639D. doi:10.1119/1.1987321. ^ lNairz, Olaf; Brezger, Björn; Arndt, Markus; Anton Zeilinger, Abstract (2001). "Diffraction of Complex Molecules by Structures Made of Light". Phys. Rev. Lett. 87 (16): 160401. arXiv:quant-ph/0110012. Bibcode:2001PhRvL..87p0401N. doi:10.1103/physrevlett.87.160401. PMID 11690188. ^ Nairz, O; Arndt, M; Zeilinger, A (2003). "Quantum interference experiments with large molecules" (PDF). American Journal of Physics. 71 (4): 319–325. Bibcode:2003AmJPh..71..319N. doi:10.1119/1.1531580. ^ Greene, Brian (2004). The Fabric of the Cosmos: Space, Time, and the Texture of Reality. Knopf. pp. 204–213. Bibcode:2004fcst.book.....G. ISBN 978-0-375-41288-2. ^ Harrison, David (2002). "Complementarity and the Copenhagen Interpretation of Quantum Mechanics". UPSCALE. Dept. of Physics, U. of Toronto. Retrieved 21 June 2008. ^ Cassidy, David (2008). "Quantum Mechanics 1925–1927: Triumph of the Copenhagen Interpretation". Werner Heisenberg. American Institute of Physics. Retrieved 21 June 2008. ^ Boscá Díaz-Pintado, María C. (29–31 March 2007). "Updating the wave-particle duality". 15th UK and European Meeting on the Foundations of Physics. Leeds, UK. Retrieved 21 June 2008. ^ Bartell, L. (1980). "Complementarity in the double-slit experiment: On simple realizable systems for observing intermediate particle-wave behavior". Physical Review D. 21 (6): 1698–1699. Bibcode:1980PhRvD..21.1698B. doi:10.1103/PhysRevD.21.1698. ^ Zeilinger, A. (1999). "Experiment and the foundations of quantum physics". Reviews of Modern Physics. 71 (2): S288–S297. Bibcode:1999RvMPS..71..288Z. doi:10.1103/RevModPhys.71.S288. ^ P. Mittelstaedt; A. Prieur; R. Schieder (1987). "Unsharp particle-wave duality in a photon split-beam experiment". Foundations of Physics. 17 (9): 891–903. Bibcode:1987FoPh...17..891M. doi:10.1007/BF00734319. ^ D.M. Greenberger and A. Yasin, "Simultaneous wave and particle knowledge in a neutron interferometer", Physics Letters A 128, 391–4 (1988). ^ Wootters, W. K.; Zurek, W. H. (1979). "Complementarity in the double-slit experiment: Quantum nonseparability and a quantitative statement of Bohr's principle" (PDF). Phys. Rev. D. 19 (2): 473–484. Bibcode:1979PhRvD..19..473W. doi:10.1103/PhysRevD.19.473. Retrieved 5 February 2014. ^ a b Hillmer, R.; Kwiat, P. (2007). "A do-it-yourself quantum eraser". Scientific American. Vol. 296 no. 5. pp. 90–95. Bibcode:2007SciAm.296e..90H. doi:10.1038/scientificamerican0507-90. Retrieved 11 January 2016. ^ a b Chiao, R. Y.; P. G. Kwiat; Steinberg, A. M. (1995). "Quantum non-locality in two-photon experiments at Berkeley". Quantum and Semiclassical Optics: Journal of the European Optical Society Part B. 7 (3): 259–278. arXiv:quant-ph/9501016. Bibcode:1995QuSOp...7..259C. doi:10.1088/1355-5111/7/3/006. ^ Francis, Matthew (21 May 2012). "Disentangling the wave-particle duality in the double-slit experiment". Ars Technica. ^ a b Svensson, Bengt E. Y. (2013). "Pedagogical Review of Quantum Measurement Theory with an Emphasis on Weak Measurements". Quanta. 2 (1): 18–49. arXiv:1202.5148. doi:10.12743/quanta.v2i1.12. ^ Pfleegor, R. L.; Mandel, L. (July 1967). "Interference of Independent Photon Beams". Physical Review. 159 (5): 1084–1088. Bibcode:1967PhRv..159.1084P. doi:10.1103/PhysRev.159.1084. ^ Sillitto, R.M. ; Wykes, Catherine (1972). "An interference experiment with light beams modulated in anti-phase by an electro-optic shutter". Physics Letters A. 39 (4): 333–334. Bibcode:1972PhLA...39..333S. doi:10.1016/0375-9601(72)91015-8. ^ "To a light particle"
^ Schouten, H.F.; Kuzmin, N.; Dubois, G.; Visser, T.D. ; Gbur, G.; Alkemade, P.F.A. ; Blok, H.; Hooft, G.W. ; Lenstra, D.; Eliel, E.R. (7 February 2005). "Plasmon-Assisted Two-Slit Transmission: Young's Experiment Revisited". Phys. Rev. Lett. 94 (5): 053901. Bibcode:2005PhRvL..94e3901S. doi:10.1103/physrevlett.94.053901. PMID 15783641. ^ Bach, Roger; et al. (March 2013). 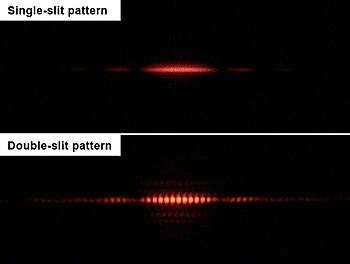 "Controlled double-slit electron diffraction". New Journal of Physics. 15 (3): 033018. arXiv:1210.6243. Bibcode:2013NJPh...15c3018B. doi:10.1088/1367-2630/15/3/033018. ^ a b Bush, John WM (2015). "Pilot-wave hydrodynamics" (PDF). Annual Review of Fluid Mechanics. 47 (1): 269–292. Bibcode:2015AnRFM..47..269B. doi:10.1146/annurev-fluid-010814-014506. hdl:1721.1/89790. Retrieved 21 June 2015. ^ Bush, John W. M. (2010). "Quantum mechanics writ large". PNAS. 107 (41): 17455–17456. Bibcode:2010PNAS..10717455B. doi:10.1073/pnas.1012399107. PMC 2955131. ^ Couder, Y.; Fort, E. (2012). 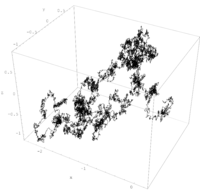 "Probabilities and trajectories in a classical wave-particle duality" (PDF). Journal of Physics: Conference Series. 361 (1): 012001. Bibcode:2012JPhCS.361a2001C. doi:10.1088/1742-6596/361/1/012001. Retrieved 23 June 2015. ^ Li, Pengyun; Sun, Yifan; Yang, Zhenwei; Song, Xinbing; Zhang, Xiangdong (2016). "Classical hypercorrelation and wave-optics analogy of quantum superdense coding". Scientific Reports. 5: 18574. Bibcode:2015NatSR...518574L. doi:10.1038/srep18574. PMC 4686973. PMID 26689679. ^ Rovelli, Carlo (1996). "Relational Quantum Mechanics". International Journal of Theoretical Physics. 35 (8): 1637–1678. arXiv:quant-ph/9609002. Bibcode:1996IJTP...35.1637R. doi:10.1007/BF02302261. ^ Filk, Thomas (2006). "Relational Interpretation of the Wave Function and a Possible Way Around Bell's Theorem". International Journal of Theoretical Physics. 45 (6): 1205–1219. arXiv:quant-ph/0602060. Bibcode:2006IJTP...45.1166F. doi:10.1007/s10773-006-9125-0. ^ Philippidis, C.; Dewdney, C.; Hiley, B. J. (1979). "Quantum interference and the quantum potential". Il Nuovo Cimento B. 52 (1): 15–28. Bibcode:1979NCimB..52...15P. doi:10.1007/bf02743566. ISSN 1826-9877. ^ "Bohmian Mechanics". The Stanford Encyclopedia of Philosophy. Metaphysics Research Lab, Stanford University. 2017. Al-Khalili, Jim (2003). Quantum: A Guide for the Perplexed. London: Weidenfeld & Nicolson. ISBN 978-0-297-84305-4. Ananthaswamy, Anil (2018). Through Two Doors at Once: The Elegant Experiment That Captures the Enigma of Our Quantum Reality. Dutton/Penguin. ISBN 978-1-101-98609-7. Feynman, Richard P. (1988). QED: The Strange Theory of Light and Matter. Princeton University Press. ISBN 978-0-691-02417-2. Frank, Philipp (1957). Philosophy of Science. Prentice-Hall. French, A.P. ; Taylor, Edwin F. (1978). An Introduction to Quantum Physics. Norton. ISBN 978-0-393-09106-9. Quznetsov, Gunn (2011). Final Book on Fundamental Theoretical Physics. American Research Press. ISBN 978-1-59973-172-8. Greene, Brian (2000). The Elegant Universe. Vintage. ISBN 978-0-375-70811-4. Greene, Brian (2005). The Fabric of the Cosmos. Vintage. ISBN 978-0-375-72720-7. Gribbin, John (1999). Q is for Quantum: Particle Physics from A to Z. Weidenfeld & Nicolson. ISBN 978-0-7538-0685-2. Hey, Tony (2003). The New Quantum Universe. Cambridge University Press. Bibcode:2003nqu..book.....H. ISBN 978-0-521-56457-1. Sears, Francis Weston (1949). Optics. Addison Wesley. Tipler, Paul (2004). Physics for Scientists and Engineers: Electricity, Magnetism, Light, and Elementary Modern Physics (5th ed.). W. H. Freeman. ISBN 978-0-7167-0810-0. Wikimedia Commons has media related to Double-slit experiments. Website with the movie and other information from the first single electron experiment by Merli, Missiroli, and Pozzi. "Single-particle interference observed for macroscopic objects"